Commercial property owners have to treat their roofs as the first line of defense against property damage. This means that roofs should be maintained on a regular basis. Repairs be of quality materials. Workmanship of the best industry standards. Commercial roof repair is a specialized trade. 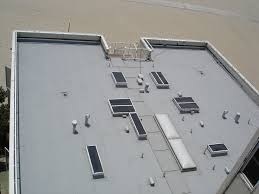 On this page we will discuss different commercial roofing systems and maintenance needs. Our Boca Raton based Commercial roofing contractor‘s are dedicated to meet all of your commercial roofing needs. From repairs and maintenance to complete re-roofing. Our crews are highly trained in all types of commercial roofing. We are the right people to call if you are in need of a commercial roof repair, . Modified bitumen roofing came on really strong in the 90’s. It’s a lot easier for a roofer to carry a bottle of propane on a roof and simply use a torch to apply the rolled roofing materials than it is to set up an asphalt kettle and pump 550 degree asphalt up there. It might be convenient, but we don’t think it’s so great. The lines parallel in the picture above are lines of uneven heat application by the torch. In those areas the bond may not be adequate and a leak can result. Also, with a torch applied system you only get the asphalt on the roll. As opposed to the additional asphalt that the hot mop provides. 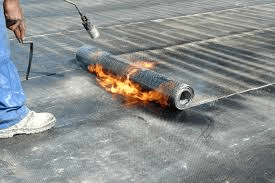 We highly recommend hot mop applications for asphalt built-up roofing. Single-ply systems are rolled in place loose laid with a six inch lap to adjacent rolls. Screws and plates are used in the laps to anchor down the roof. The laps are heat welded together using hot air guns. 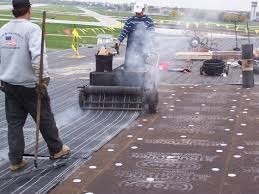 Quality commercial roofing contractors like us use robotic heat welders to ensure perfect welding. There is one advantage to single-ply roofing systems and that is their ability withstand ponding water. Single-ply roofing was developed as an offshoot for tank and pond liners. While asphalt roofing is broken down through oxidation by water, these single-ply system can have water on them 24/7 without damage. 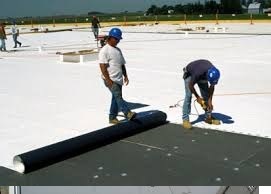 Polyurethane foam roofing might be considered a third category but it represents such a small percentage of the commercial market share it cannot really be considered a contender (Not to mention its poor performance record). Does your flat roof need to be sloped? Believe it or not, many years ago, it was thought that having water “pond” on your roof offered insulating benefits. There were many roofs designed to pond water. Today we know better and in fact, under the new Florida Building Code, new roofs are required to be designed and shed water. This does not mean that your existing flat roof has to be re-redesigned to shed water. So lets clarify that! If you have an existing flat roof without a pitch, and you are re-roofing it, you do not have to install a pitch for the new roof. The new Florida Building Code says that flat roofs must be sloped on all newly constructed buildings, not as a retrofit. So, if you have a commercial contractor telling you that you have to provide a pitch for a new roof, call us fast! Is it better to have a sloped roof? You Bet!. But you don’t have to pay for it is your don’t want to. Your roof will eventually develop a weak spot and start to leak. This can be caused by lack of proper maintenance or natural wear over time. Our expert roofers will identify the source of the leak and perform the most effective repair available. Severe weather, such as hurricanes, can also cause roof emergencies (sections ripped off, tree falling on your roof, etc.). Whether you have a leak or an immediate emergency, our team will respond as quickly as possible to get your building back in order. We repair all roof types, including Tile roofs, shingle roofs, flat roofs, and metal roofs. Are you planning to install a completely new roof? We can help. The first step, though, is up to you: What kind of roofing warranty are you looking for? Commercial roof warranties can be from 10 years and up to 25 years. Roofing warranties are really the dirty little secrete of the roofing industry. This is particularly true with commercial roofing systems. Most roofing warranties are written highly in favor of the manufacturer and contractor. Those of us in the industry affectionately refer to these warranties as “taillight” warranties. When you can't see the roofers truck taillights anymore, your warranty has expired. At Preventive Maintenance Support Services Company we really do stand behind our work. We are not afraid to return and fix anything that’s needed. We can also step it up a notch and provide you with a system warranty by the manufacturer. The advantage being the manufacturers have bigger pockets and in most cases have set up funds for warranty claims. Metal roofs are common among commercial properties. Standing seam metal roofs add a great touch to your architecture and do not wear out as quickly as other materials. These roofs may come with a fifty-year warranty. Corrugated metal roofs are less costly than standing seam, but are just as durable; they are usually installed on sheds, barns, and other small buildings. Our team specializes in metal roof repair, so if you choose this material you can rely on us to service any problems. Asphalt shingles are a common option and generally come with a thirty-year warranty. These shingles have gone through several improvements over the years and are available in a range of colors. If you are unsure of which roofing materials will be best for your building, our team of roofing of commercial roofing experts will help you make the right decision. Give us a call! Call us if you need a commercial roof repair done right! From repairing a small leak to complete roof replacement, we are here to help you with all of your commercial roofing needs! Call us today at (561) 586-5655 for a free estimate.